I am working with a cross-disciplinary network of clinical-care specialists to experiment with more effective approaches to managing clonus – that is, uncontrollable repetitive spasming of muscles. By definition, those of us with ALS have both Upper and Lower Motor Neurone problems. UMN symptoms tend to show themselves, amongst other things, as spasticity (muscle stiffness), whereas the equivalent LMN symptom is muscle-wasting. Although I have ALS, my symptoms at the moment are predominantly UMN – the partial paralysis of my legs is spastic rather than flaccid. However, many people with spasticity also get clonus, which is notoriously difficult to manage. And for me, it is my clonus (rather than spasticity itself) that can make walking impossible. Even a slight increase in my alertness exacerbates the clonus: seeing a good friend can trigger it; seeing a truck coming toward me (perfectly safely) can send it into overdrive. The default response from Neurologists to clonus seems to be “take baclofen, and if that doesn’t work try tizanidine”. Both of these are muscle relaxants, with very common side-effects of tiredness and nausea. Indeed, I had a top neurologist in London who – seeing my extreme clonus – claimed I was “massively undermedicated” because I was only on 30mg of baclofen a day. He suggested trying up to 90mg a day, which is the highest dose allowed outside of hospital. I dutifully tried the experiment for a month. I suffered chronic tiredness as a result. The clonus was hardly affected. Now, however, working as a cross-disciplinary team with neurophysiotherapists, orthotists, spasticity clinicians, neurologists, and my GP, we have progressively refined a composite treatment that has significantly reduced my clonus: Ankle-Foot Orthoses on both legs, botulinum toxin injections in both calves every three months, propranolol (a type of beta-blocker) orally three times a day and – only at night to avoid cramp not clonus – a low oral dose of Tizanidine (a form of muscle relaxant with a short half-life) that wears off by the morning. 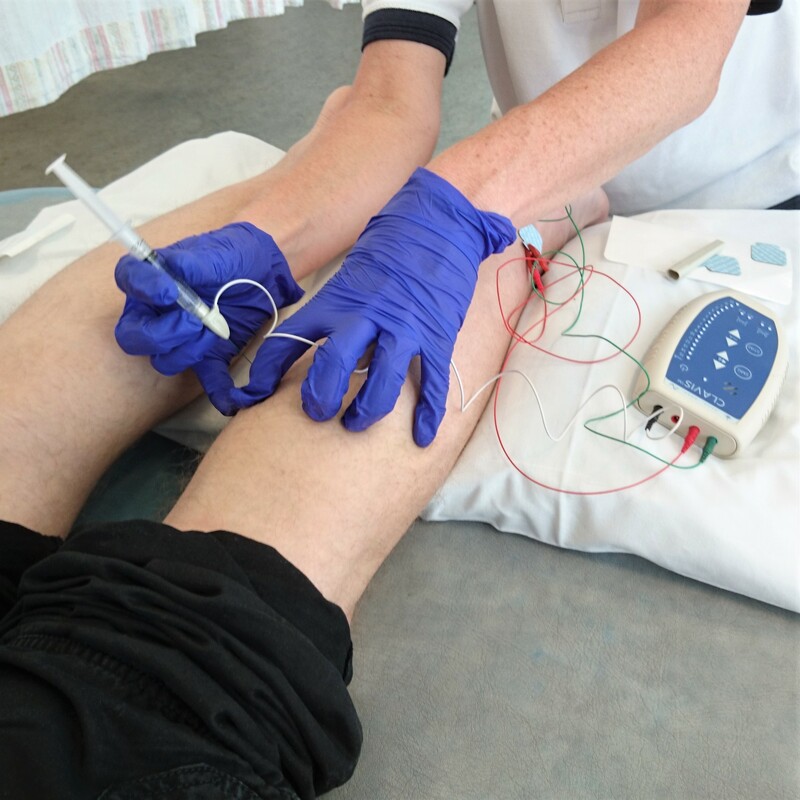 I receive the injections (seven across both legs) with the excellent support of the Torbay and South Devon NHS Foundation Trust. Using Botox is not usual for MND, indeed Botox is not licensed for MND. However, it is licensed for spasticity. Supplemented by propranolol the effect – on me at least – has been dramatic. The hypodermic needle in the picture is actually also being used as an EMG electrode to ensure the tip of the needle is in muscle rather than connective tissue, so when the Botox is carefully injected it is guaranteed to be effective.